A sensor network ? based on newly developed radar sensors mounted overhead ? continously monitors the parking lot and reports the occupancy status to a parking control center. Because the sensors are easy to install on or in street lights, there?s no need for major interventions into the infrastructure. The solution is also more accurate? and not only notifies if there is an object in the parking space, but also sends information about the size and position of the vehicle. The overhead system also detects any obstructions on cycle paths, bus lanes or garage and forecourt entrances caused by incorrectly parked vehicles. The measurement data is transmitted via mobile radio to the control center, which records the sensor data, calculates the corresponding parking space occupancy, and prepares it for use by app operators in services such as assistance for drivers in locating parking spaces. What makes the solution really special is that the software works with a system that is capable of learning. It detects recurring parking space situations at particular times and calculates forecasts so that users know what to expect when they arrive at their destination. Siemens uses technology from the US company Intel for connecting the sensors to the internet. The Intel IoT (Internet of Things) platform enables the parking sensors to be connected securely and flexibly with the control center. 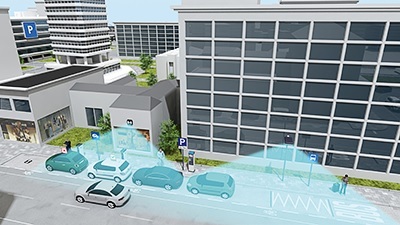 In this way, Siemens and Intel are laying the foundations of a sensor and communication network for future Smart City concepts.